My Thought: Many teachers who are doing wonderful things are insecure with their efforts. They do not believe that what they are doing is effective. They continue their work in isolation doing what they believe is best for their students but have no data to support their efforts. Administrators do not recognize their efforts and at times do not even understand what they are doing. It takes an extremely confident teacher to be willing to step out of the shadows and share their strategies, and plans. On the same token, there are extremely confident teachers who are ineffective but boastfully share their ineffective strategies and plans. It’s finding those effective educators and getting them to share is what would be most powerful. Jackie, this is a great post and I love both images. I do wonder if the man in the cartoon might have had a different impact on the woman though. She was so pleased with what she had done, and he just listed all the things she hadn’t done straight back to her. 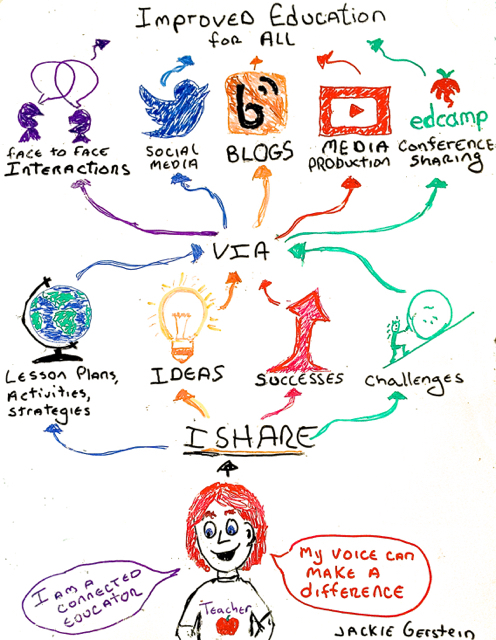 I am also thinking about how your hand drawn image might be even more powerful in the student layer was factored in. Plenty of food for thought – thank you. Jackie, I strongly believe in helping to establish a learning network, where you not only get amazing ideas from people all over the world, but also sharing ideas back to the community. As educators, we are often very humble and believe that we are just doing what we do, we are sure that everyone understands this. However, there are so many things that educators do every day that should be celebrated! We just need to be brave enough to take those first steps. Your post reminded me of a video that @scsdmedia shared with me Obvious to You, Amazing to Others https://www.youtube.com/watch?v=xcmI5SSQLmE. This message echoes in my head over and over when I think about what I should share with others and may want to skip over something because it seems so insignificant. Thanks for your feedback and I agree about being brace. The video you referenced is amazing – thanks for sharing it here.